ORLANDO, Fla. - Dec. 26, 2014 - PRLog -- Pangolin Laser Systems, Inc. the world’s leading provider of laser display software and control hardware for the entertainment industry, took the 2014 International Laser Display Association (ILDA) Awards by storm this year. Pangolin clients received a total of 18 awards at this year’s ceremony, and particularly excelled in the fields of beam and atmospheric shows, live laser performances, innovative applications, nightclub and festival shows, live television laser performances, and technical achievement awards. 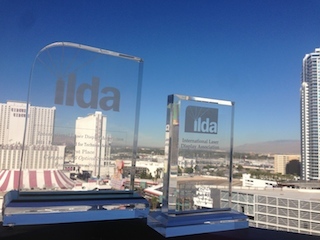 The ILDA Awards are considered by many, to be the “Oscar’s” for the laser industry. And while the competition was fierce this year, ILDA Members using Pangolin software and control hardware continue to excel in this increasingly competitive award’s ceremony. The International Laser Display Association was founded in August 1986, and is the world’s leading organization dedicated to advancing the use of laser displays in the fields of art, entertainment, and education. ILDA promotes the use of laser displays in the international marketplace through awards programs, publications, technology standards, and a code of ethics. ILDA also represents the industry on safety issues and provides forums for members to exchange ideas, forge partnerships, and explore new technologies. ILDA helps its members relate to each other not as competitors but as colleagues who share a common goals and problems within the laser industry. For more information on ILDA, or to become a member, visit: http://www.laserist.org. Since 1986, Pangolin has amassed over 50,000 clients in 70 countries, firmly positioning themselves as the world leader; providing software and hardware solutions to the laser show and entertainment industries. The company, with offices in the USA, Central Europe, and Mainland China, has received more than 22 artistic awards for technical achievement and product quality, and their software has contributed to more than 400 Artistic Awards for its users. Pangolin has products being used by some of the largest events, companies, and brands currently known, including major theme parks such as Disney World, SeaWorld, Universal Studios, and Six Flags; major motion picture companies such as 20th Century Fox and DreamWorks pictures; high-tech companies such as PC Magazine, Boeing, and Lawrence Livermore Labs; popular brands such as Mountain Dew, T-Mobile, and Motorola; major sports teams and events such as the Orlando Magic, Philadelphia Eagles, and Super Bowl XLIV, Qlimax, Electronic Daisy Carnival (EDC), Ultra, Tomorrow Land, Tomorrow World; and top-named musical talent including Madonna, Drake, Usher, Metallica, Maroon 5, Kanye West and Jay-Z, the Black Eyed Peas, Jennifer Lopez, Shakira, Jean Michel Jarre, Justin Timberlake, Tiesto, Skrillex, Steve Aoki, Calvin Harris, and many others. For more information on Pangolin and their award winning line of products, visit their website at http://www.Pangolin.com. You can also find them on Facebook at http://www.facebook.com/PangolinSystems. Justin Perry - Pangolin Laser Systems, Inc.
: Justin Perry - Pangolin Laser Systems, Inc.